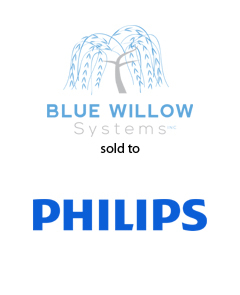 AGC Partners is pleased to announce that its client, Blue Willow Systems, a cloud-based senior living community resident safety platform, has been acquired by Philips. The acquisition will further expand Philips’ senior living portfolio through collaboration with Inovonics, a leading provider of high-performance wireless sensor networks for life-safety applications. Furthermore, Blue Willow Systems complements Philips’ existing CarePoint 6.0 senior living platform by providing the company’s customers with new solutions for resident and staff management with a Software-as-a-Service (SaaS) business model, and added functionality such as Bluetooth-enabled wearable devices and access points, real-time location tracking and enterprise reporting. These solutions will ultimately link the home, senior living communities and healthcare organizations, helping residents and their families along the aging journey. With a team led by Hugh Hoffman, AGC Partners acted as sole financial advisor to Blue Willow Systems.